The best laid plans never go smoothly. With the weather being positively Baltic, I'd decided that I'd give Carrot and Coriander Soup from Leith's Simple Cookery a whirl today. 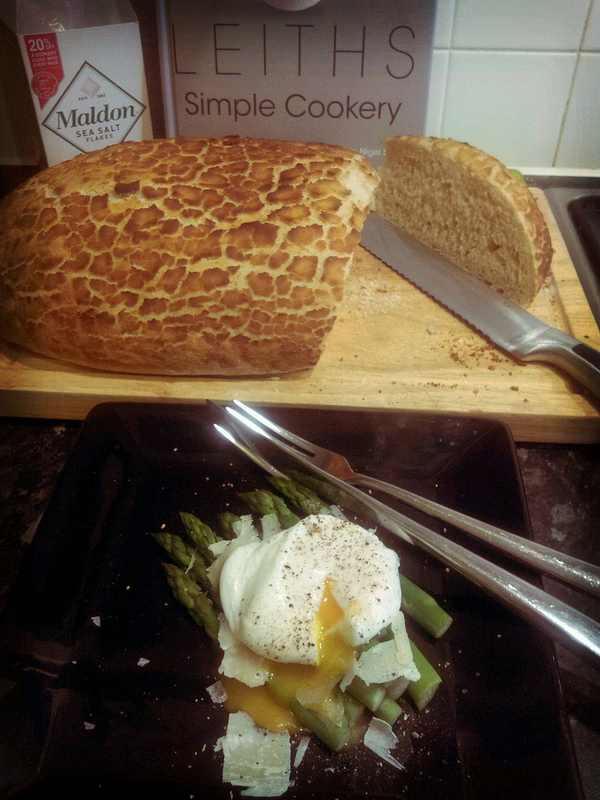 And because the soup is so low in fat and uber-healthy, I thought I'd make a lovely fresh Tiger/Giraffe loaf to go with it (thus undoing most of the soup's virtuousness). Of course, I'd not bargained for losing an entire night's sleep thanks to the cold; my husband then getting into bed just as I was falling asleep and doing Miranda's "Cold Bed Dance' (can't find a video of it though - the Miranda version, not my husband's); my toddler daughter waking up feeling poorly and wanting the entire Maisy Mouse back catalogue read to her; returning to bed and just dropping off to sleep only for the husband to shout 'Boo' in my ear (he reckons he was having a nightmare); Miss A reawakening after the Calpol wearing off and wanting to watch back-to-back episodes of Justin's House on the Sky Box and then eventually ending up not being able to prise myself away from her limpet-like, poorly girl needs in order to make said soup. I did manage to make the loaf one-handed (thank goodness for my Kenwood). I have muscles like Popeye in my left arm now after holding a 15kg toddler whilst making said bread. So when I finally got her into bed for a nap, I figured that I had better find something quick and easy to cook - especially as I'd not eaten at all by 2pm and I was hungry. Flicking through Leith's again, I picked the very first recipe in the book - simple, healthy and supposed to be served with a wedge of crusty bread which I had plenty of. Is that a Tiger or Giraffe in the background? The recipe calls for a soft-boiled egg cooked in a pan of water from cold and boiled for three minutes. I came unstuck here. Unlike the shell on my egg, which wouldn't come unstuck. As I was trying to peel said egg, the shell just wouldn't come off, and I ended up ripping the egg apart and the middle ran out. So after cooking the asparagus, I quickly poached an egg instead. Similar result as the soft boiled egg in the end dish - much less faff in my opinion. This is a really simple and tasty dish although not really one to be serving in the depths of winter. If I was a good girl, I'd only cook it in May when asparagus is in season. It's a variation on another recipe I'd been promising myself I'd try from Nigella Bites - Soft Boiled Eggs with Asparagus Soldiers. But this is a bit posher. It would make a really good breakfast or brunch dish on a special occasion. If I was serving it to a non-veggie, I'd consider adding a little crisped prosciutto to the plate too. I bought a box of Maldon Sea Salt for the first time yesterday and now understand why it could seem special. But regular sea salt would work just as well too. Would also advise warming the serving plates if making this mid-winter as mine was cold by the time I'd finished faffing with the photograph. It still tasted good though. In a deep pan, cook the asparagus for 2-4 minutes until tender. Remove from the pan with a slotted spoon, dry on kitchen paper and keep warm. Using the same pan of water, poach the two eggs. My thoughts on the best way to poach an egg can be found here. Just before the eggs are ready, divide the asparagus between two plates and arrange so the spears all point in the same direction. Scatter the Parmesan over the asparagus. Remove the eggs from the water using a slotted spoon. Pat dry with kitchen paper and place on top of the asparagus. Season with salt and black pepper. Serve immediately with lots of crusty bread.